Nero, his bare head right Globe at point of bust. Reverse - CER QVINQ ROMAE CON, S C in Exergue. Minted in Lugdunum (Lyon, France) in 66 A.D.
in 60 A.D. and 65 A.D.
Sutherland, C.H.V., "Roman Imperial Coinage", Volume 1, revised edition (RIC), p183, nr. 560. Mattingly, H., "Coins of the Roman Empire in the British Museum", Volume 1 (BMC), p278, nr. 393. 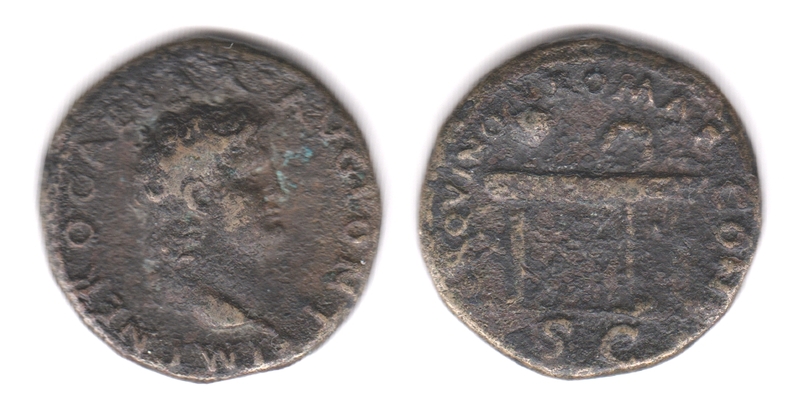 Sear, D.R., "Roman Coins and their Values" (RCV Millennium Edition), Vol 1, p391/392, nr. 1979/1980 var. Van Meter, D., "Handbook of Roman Imperial Coins" (VM), p87, nr. 34, var. Kampmann, U., "Die Münzen der römischen Kaiserzeit", 2nd edition (Kampmann), p43, nr. 14.29. For comparison, a better specimen on the wildwinds.com websitecan be found here.